Hello Everyone, I hope you are all well. September is International Guide Dog month, there is so many ways that Guide Dogs impact the lives of blind and partially sighted people all over the world. 2 years ago today I was so grateful to be walking across the stage to graduate with my first guide dog. It was an emotional day I was so happy to have received him and what he was going to do for my life. But I was also sad, I was sad for Rick’s puppy raisers they loved him just as much as I did and they had to say good bye. I was very happy that they had made the trip to Portland, OR to meet me and be a part of Rick’s graduation. Rick’s puppy raiser gave me the best gift besides my children I will ever receive. Being able to raise a dog for a year and pour so much of your heart and soul into training and socializing the dogs and then have to say good bye. This has to be a very hard thing to do and I am beyond grateful for their huge hearts and incredible gift. Now that Rick and I have been a team for 2 years now we are a pretty well oiled machine. We have an amazing relationship and I could not ask for a better guide. He knows me very well and can usually predict where I am wanting to go, also his coffee finding skills are out of the park. He is happy to traipse all over the country side going to events and shopping and sitting through many hours of meetings and he is happy to cuddle and keep me company when I work from home. There are so many ways that Rick has changed my life he has helped me to embrace my disability and live my life my way. He has helped me to find my confidence that I have always wanted to have. Rick has also made the work of advocating and educating the public a little easier because people want to talk to you when you have an adorable yellow lab wagging his tail sitting next to you. It is like he makes people more comfortable to approach us and talk. So many of the things I have mentioned are not even guiding tasks, and that is what I want people to know, a Guide Dog does more than just show us the curbs and take us around obstacles. They enhance our lives so much. Thank you to everyone who makes it possible for people who are blind or partially sighted to have Guide Dogs in their lives you are amazing ! 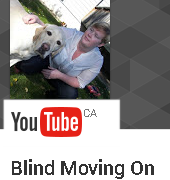 She’s Not Completely Blind !